I had posted the Achari Murgh quite some time back and a many of you tried it out. 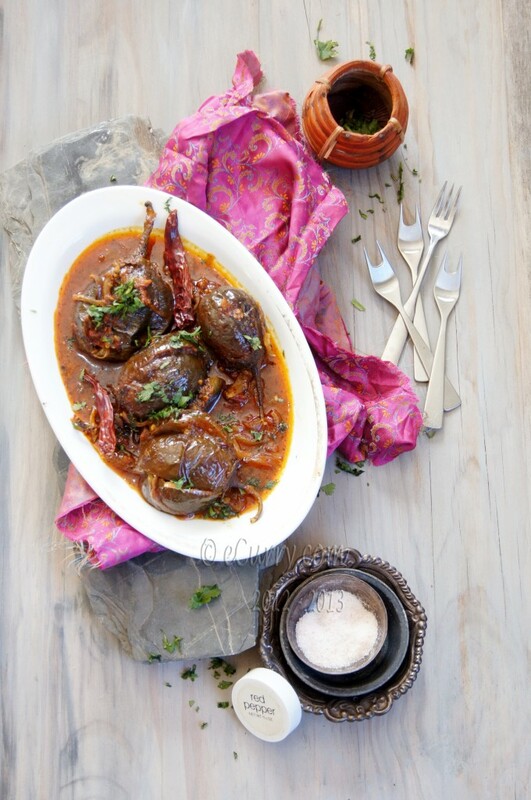 The Achari Murgh is probably one of the most tried recipes from this blog. A lot of you also wanted to know of vegetarian options for the “Achari“. Here is one. 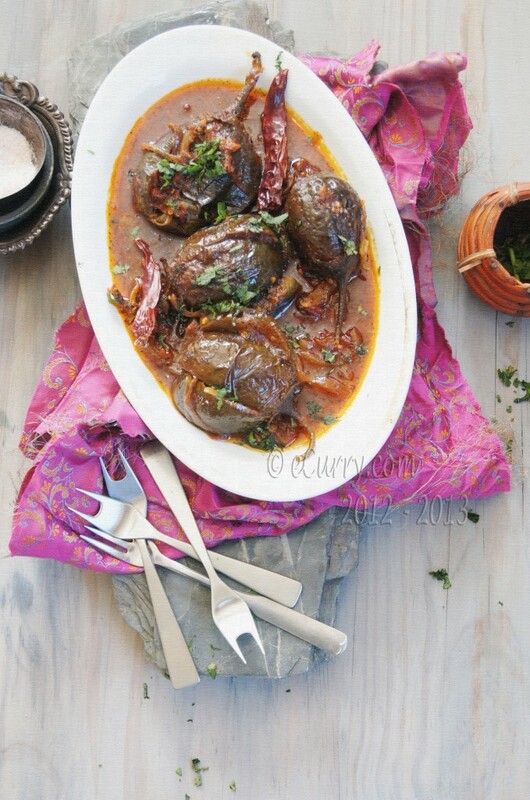 The eggplants were slowly simmered in a sauce and the tantalizing smell of the spices made everyone walking around our home thinking out loud what it is that we were having for dinner. Nature showered us with eggplants very abundantly this summer; we are still getting some, as Texas never really gets started with winter until mid December and that is if there is any winter at all. Any kind of eggplants may be used. I have used the small baby Indian kind as these were the most I harvested that day. 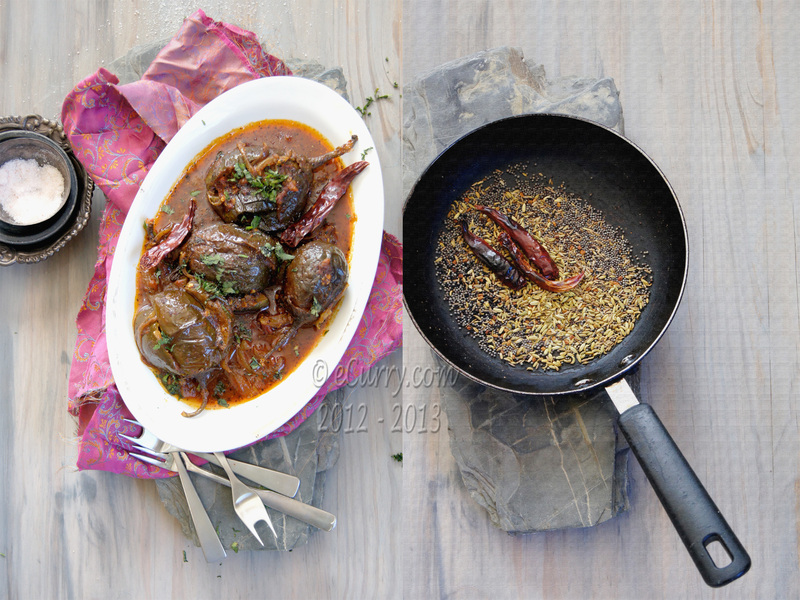 The other vegetarian kind of the Achari dishes may be made with potatoes, paneer or anything you can think of. It is the medley of spices that makes it so special and I would think any vegetable would get a new life in this sauce. In northern regions of India, a good number of pickles use the spices that make the Indian Five Spice mix or Panch Phoron, in different proportions along with pure virgin mustard oil to make the base spice mix. The flavors are strong and there is something in this combination that would make you salivate; literally. 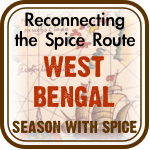 The aroma of the roasting spices will make your spirit dance with joy. On another note, we are surrounded with oodles of fun at this moment. I have my cousin sister and her family visiting us. The two little boys that she packed with her and flew across the world to be with us for a couple of weeks, are just the cutest things around I have encountered in a while. All the baby talk is keeping us amused day and night and it just feels so good to play with those little toes and fingers. 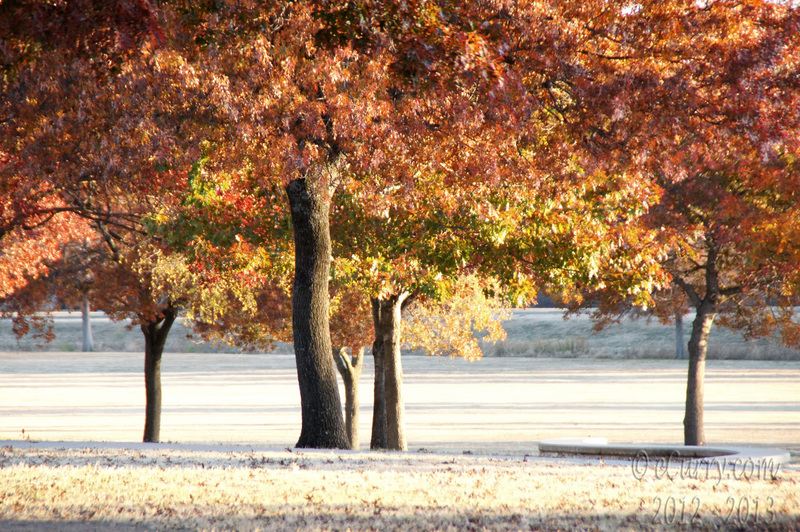 It is a beautiful time of the year, as we see the world via the changing hues. The shadows get longer, the air is crisp and the crackling fall leaves beneath our feet a constant reminder of the how delicate life is… all the more reason to remind ourselves to share and love and give with our heart. This is the first time in the past 6 years that I have not been missing the fall colors of the north! 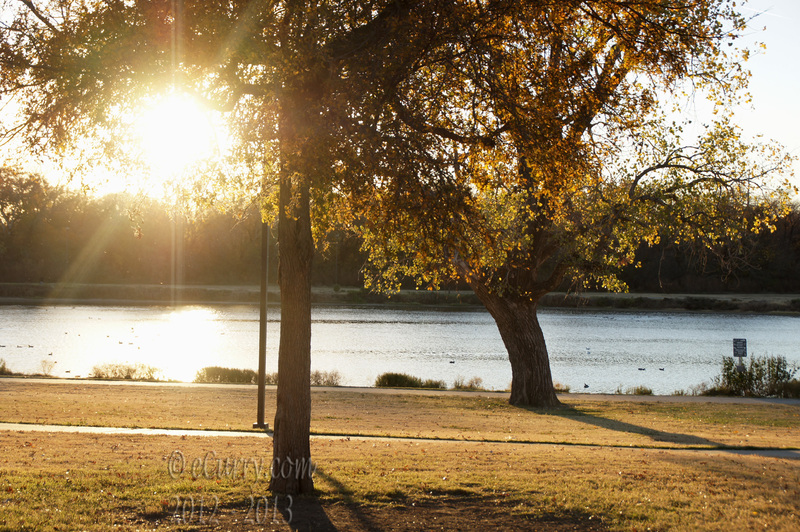 It is simply gorgeous around here! What a lovely way to start the holiday season! Heat a pan on the stove. Switch off the heat and place the spices (red chillies, mustard seeds, fenugreek seeds, cumin seeds, fennel seeds, nigella/kalonji/onion seeds, cinnamon and cloves). This process very lightly toasts the spices. You do not want them to be overdone or browned. 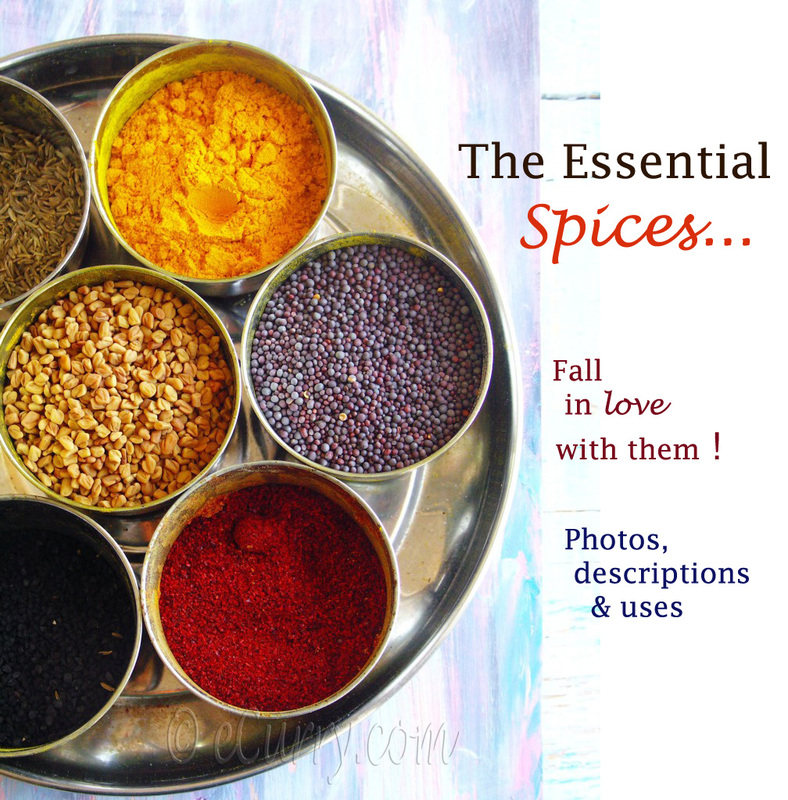 Cool the spices and grind coarsely; combine with the hing/asafoetida and set aside. Make ‘X’ ( – a cross) to the flesh of the eggplants, but leave the stems intact. Immerse them completely in a big bowl of salted water and set aside for at least 30 minutes. When ready to cook, remove eggplants and squeeze out the water. Heat oil (both mustard & vegetable/canola together, if you are using both kind) in a thick-bottomed pan. Add onions and sauté till light brown. Add grated ginger and continue to sauté for about 7 minutes at medium heat. Lower the heat and add the coarsely ground dry spice powder. Cook for half a minute, stirring all the time so the spices do not stick to the pan. Combine chili garlic paste with the pureed tomatoes; set aside. Add the eggplants & cook on high heat till the outside of the eggplants start to brown on all sides. Add grated tomatoes with garlic, the turmeric powder, red chili powder and salt to the pan and toss well till everything is well mixed. Cook at medium heat till oil is slightly bubbly and leaves the sides of the pan. Add about 2 cups of water, (more or less as needed to soften the eggplants and also to have a bit of sauce), stir, and cover the pan. Cook on medium heat till the eggplants are tender. Uncover and cook for a while or till the sauce is to your desired consistency. There should be enough sauce to dunk a bread and eat, but not too watery or soupy. Drizzle the lemon juice if you wish to. Garnished with fresh coriander/cilantro. 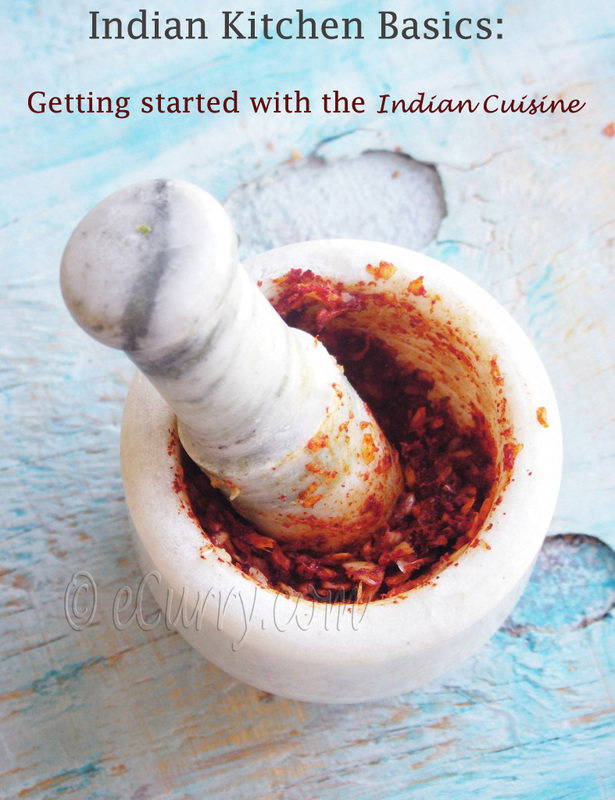 Serve hot with Naan/Paratha/Flatbread or Pulav/Pilaf. 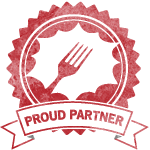 November 28th, 2012 | Category: Curries, Sides & etc. A scrumptious dish! It looks ever so mouthwatering. Last time I had this was when i was with my sister, atleast i think it was this I had. I am drooling in the pic and i love those funny looking cute forks . Nice recipe and lovely pics soma. 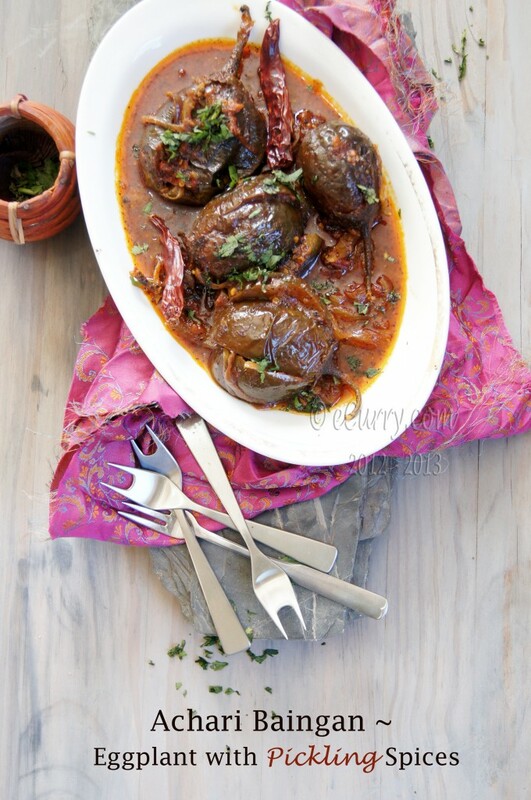 Does this work with big brinjals as well….Do we handle all brinjals the same way, big or small?? Thank you! 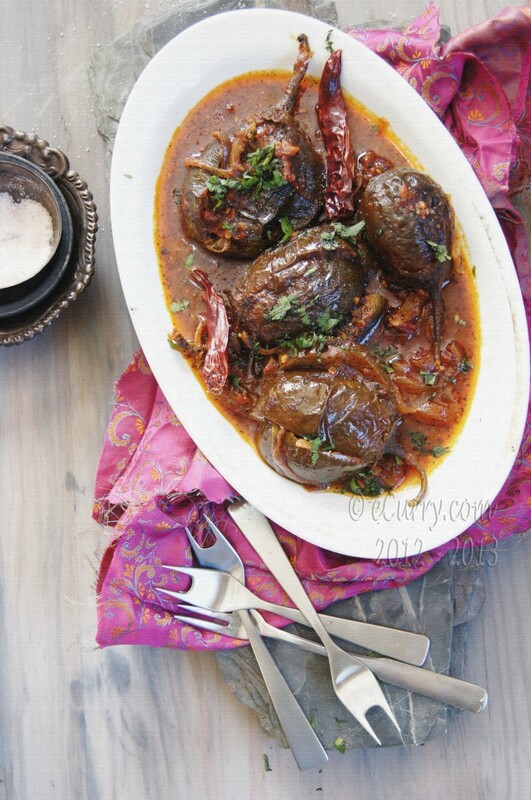 Yes it will work with any brinjal. Since they are not stuffed, but cooked in the spice mix, you can just slice/chop the bigger ones in desired size and cook in the same way. The long Asian eggplants cook really fast and have less seeds, so they work good too. Beautiful Soma. 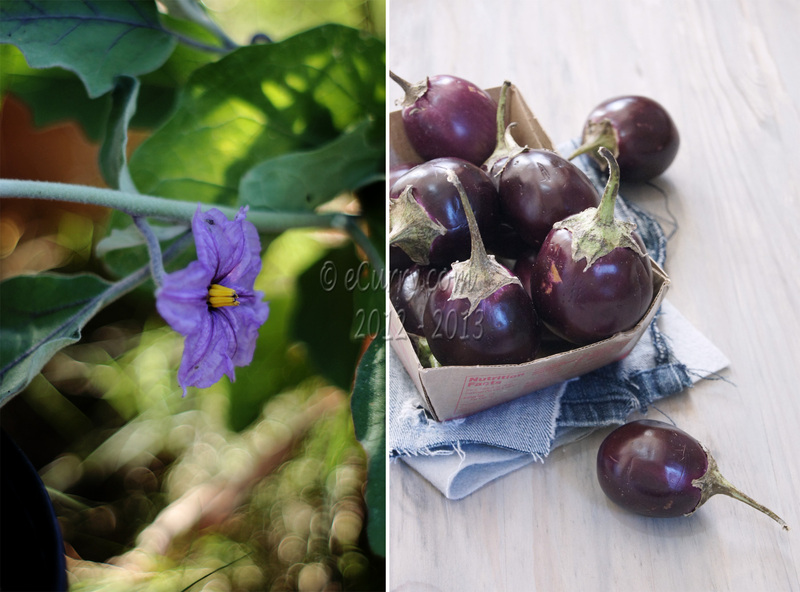 I’ve always found that eggplants spoils almost any photograph that I take – can never make them look yummy. Your of-course is an exception! As soon as I read the latest post from your blog I knew I had to try it out. It helped that I had a few small Asian eggplants in the fridge waiting to be cooked! It’s another story that today we had unexpected guests and you would have guessed by now that the Achari Baingan received a lot of compliments and was finished even before I could have my share!!!!!! I can’t wait to make it again! 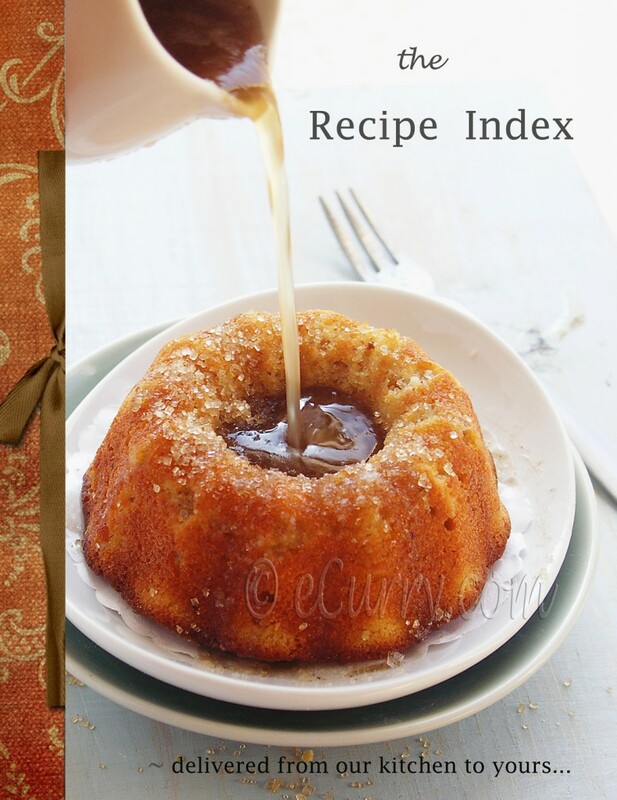 It turned out delicious and what a simple receipe packed with such flavor! Thank you for posting this and making my day! Absolutely love achari baingan. Scrumptious pics. It’s been a while since I’ve made this so thank you for the reminder. I’ll surely be cooking this soon. 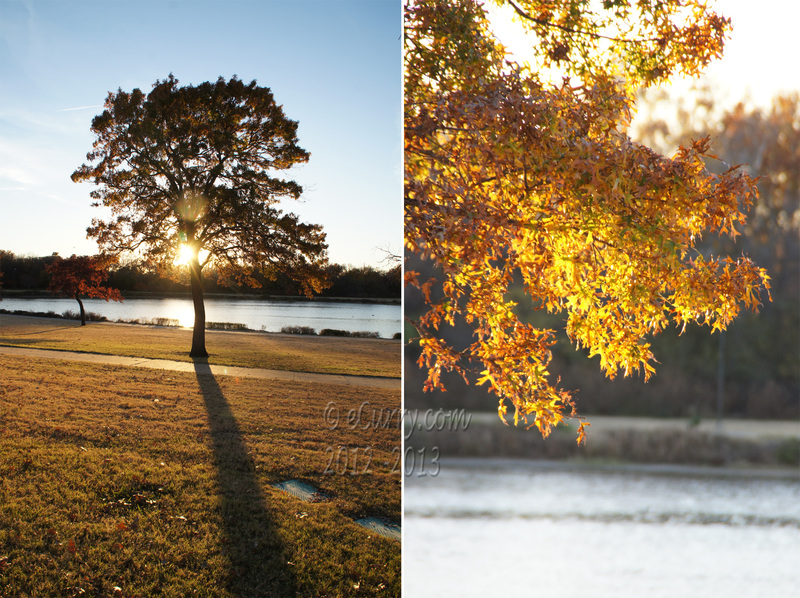 BTW, are those nature pics from white rock lake? How gorgeous does that look Soma! Love it… I can’t believe we’re actually getting our first snow of the season today. I don’t feel like winter yet but I guess it has arrived! It’s beautiful, I mean the food pictures and not only. Great meal and unique photography. Those li’l eggplants are so lovely. Oh wow, that is just sheer yumminess! Lovely. I have tried this recipe with few tweaks with the ingredients that I had and it turned out awesome! Great post and i am a regular visitor to your site.